"Countries where the waters of the Dordogne, the Garonne River and the Atlantic ocean wed to form the largest estuary in Europe, this trip has something for all appetites of nature and culture, leisure and sports, friendliness and gastronomy. Marshes, vineyards, forests, rivers, small ports, towns and charming villages, castles, wine estates and churches make up the landscape under the sun of the southwest area! " 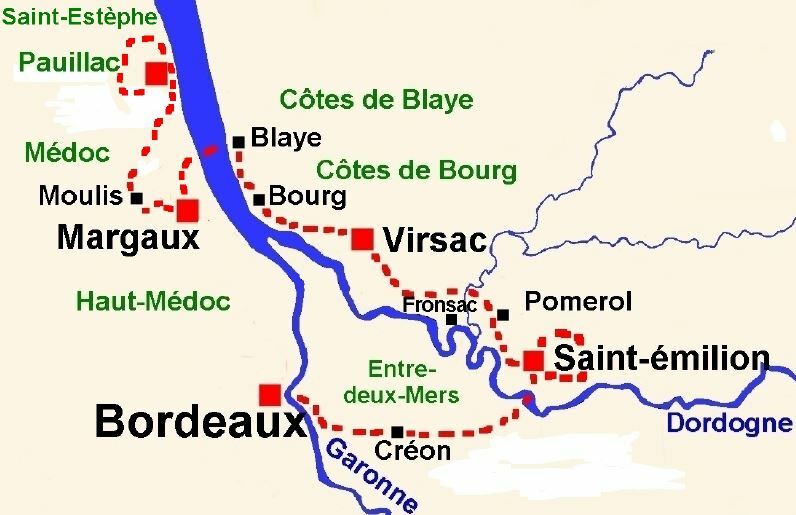 Roads and trails are opening the way to other landscapes: The vineyards of the Medoc, Pauillac, Margaux, Gironde Estuary, Upper Gironde, and the vineyards of Saint Emilion, Pomerol, Fronsac, the Entre-Deux-Mers and the beauties of Bordeaux. You will love the comfort of our chosen accommodations, as well as the quality of the local cuisine you can enjoy during dinner. You go through the Haut-Médoc and Margaux Vineyards before taking the boat to cross the estuary and continue your tour on the other side, in the Haute Gironde. You will take the Medoc “Route des Vins”, where are some of the most famous wine chateaux in the world, visit the citadel of Blaye, built by Vauban, stroll through cities and charming villages and discover the sunny slopes of the beautiful hills of Entre-Deux-Mers, a succession of vineyards and prestigious monuments. You will stay in the heart of World Heritage Sites by UNESCO, such as Bordeaux and Saint-Emilion. This cycling tour, alternating cycle paths and minor roads in quite flat terrain along the river and vineyards, will delight you with its diversity of landscapes. You will be accommodated every night in 3 stars hotel and charming guesthouses. Arrival at the train station or airport of Bordeaux. Transfer by taxi to the Pian Medoc. Delivery of your bike, information about the area and the road book. Departing from Pian Medoc to Macau, the chateaux’s road goes alongside the Gironde toward Margaux and Moulis...wine and spirit houses are waiting for you. The Medocain area is well known worldwide because of the name of every village and every chateau make amateurs and wine passionate dream. One must stop in the little harbour such as St Julien in order to imagine that in past times, the “gabares” crisscrossed the stream loaded with barrels.This chateaux’s road which crosses the Medoc is assuredly one of the most beautiful! You will start your bike itinerary by crossing the vineyards of Margaux, Haut-Médoc wile cycling among some of the most well-known Chateaux. If you are heading toward the estuary, you will make most of this itinerary without any difficulty whilst encountering pleasant and diversified landscapes whatever the season. This circuit will lead you to the heart of the “Medoc rouge”. Transfer by taxi to Pauillac. Delivery of your bike, information about the area and the road book. Day 2: La Route des grands crus – 45 km You will leave Pauillac, home of 3 of the 5 first Grands Crus Classés and 15 Crus Classé Medoc, toward Margaux. You will discover the biggest stars of the 1855 wine ranking with stunning architecture, but also all the other jewels of this reference vineyard . Your tour will pass by the famous Lafite Rothschild, Latour and Mouton Rothschild, 1st Great Classified Growths, but also by the Châteaux Pichon Longueville (2e cru), Pontet Canet and Lynch Bages (5th classified growth). This route is certainly magnificent! Throughout this trip, the Grands Crus succeed each other. Pauillac, Saint-Julien, Moulis down to the village of Margaux and the famous Chateau Margaux. Stop in front of the entrance of Château Margaux and admire the classical façade of the building constructed in the early 19th century. This route will lead you to Lamarque where you embark for the crossing of the Gironde estuary. And you will reach the magnificent citadel of Blaye before continuing your journey on the banks of the estuary. Imposing and majestic citadel overlooks the estuary with its 33 hectares in the heart of the city, offering a splendid view over the Gironde. You will pass through the vineyards of the Cotes de Blaye AOC Bordeaux and Bordeaux Supérieur. Finally, you will cycle towards Bourg-sur-Gironde, along the "Corniche Fleurie", where the presence of countless palm trees, pink laurels and oaks reflects a climate of great sweetness. A visit is a must for lovers of beautiful stones: Bourg-sur-Gironde is an architectural jewel. Clinging to a rock, surrounded by walls, the village is one of the most beautiful and best preserved of the estuary. On the road to get to Saint-Emilion vineyards you will cross two other appellations: Fronsac and Pomerol. The wines of Pomerol are among the most appreciated in France, including the famous "Petrus". Chateau Angelus, Chateau Petrus, Chateau Cheval Blanc! 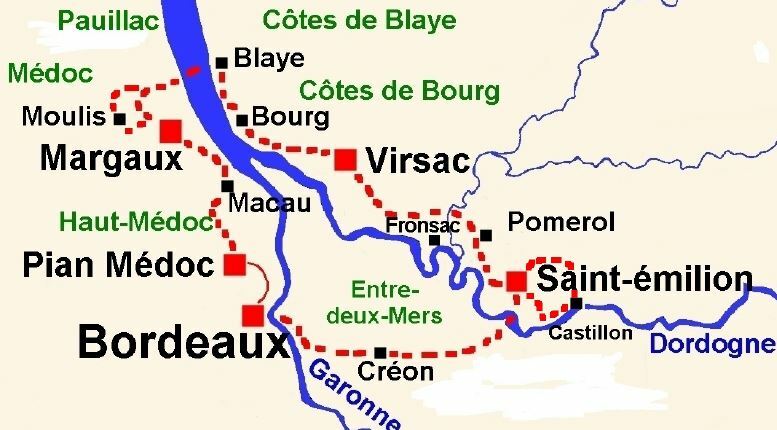 Let’s talk about Fronsac: this is the most historic vineyards of Bordeaux since we drank Fronsac in the court of King Louis XIV. At the confluence of two rivers, the Dordogne and Isle, great terroirs of Saint-Emilion, Pomerol and Fronsac marry beautiful landscape of hills and plateaus, forming a beautiful mosaic of plots, vines extends to infinity. On this tour you will discover beautiful domains, often planted in the vineyards and inhabited by the growers and their families. The program, estates, old stones and remarkable sceneries. You can reach Castillon la Bataille and return by the bank of the Dordogne River. After passing through Branne on the Dordogne River, you will reach the bike path "Roger Lapébie" and enjoy an ideal route for a ride in the heart of natural landscapes, with several rest stops and water points. You will follow this pleasant track which goes to Creon, typical bastide village in the region. You will ride through a rich architectural heritage, medieval towns, country houses, fortified mills, abbeys, Roman churches. This will take you to the majestic Place de la Bourse in the heart of Bordeaux. You will have an overview of the wharves, the Garonne and the stone bridge you cross a few minutes before! Meeting with a representative with presentation of the bikes and the tour.